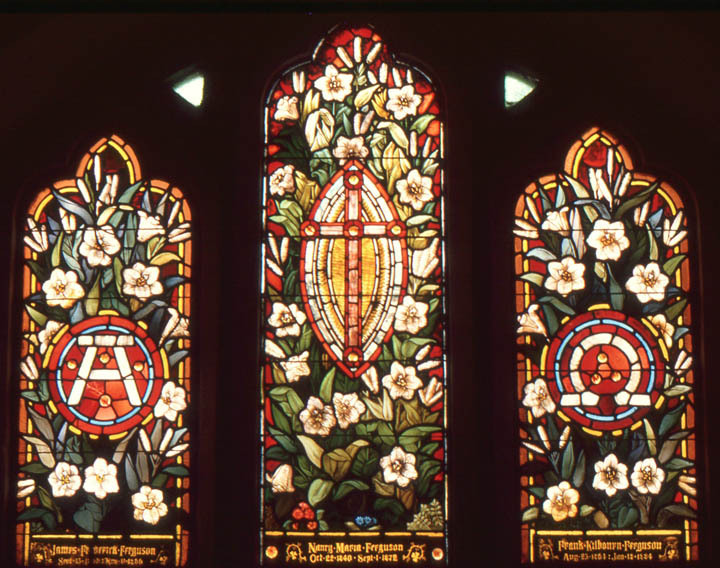 Brief Description of Subject: This window was once located in the transept of the Church but now resides in a hallway of the annex. This new location required the window to be illuminated artificially. White lilies, the flower of the Resurrection, provides the background for the capital Greek letters "Alpha" and "Omega" as well for a mandorla enclosing a cross. Those Greek letters come from Revelation 22:13 (KJV) --- Christ describes himself as the "Alpha and Omega, the beginning and the end, the first and the last."